What was Minnesota History Roulette? 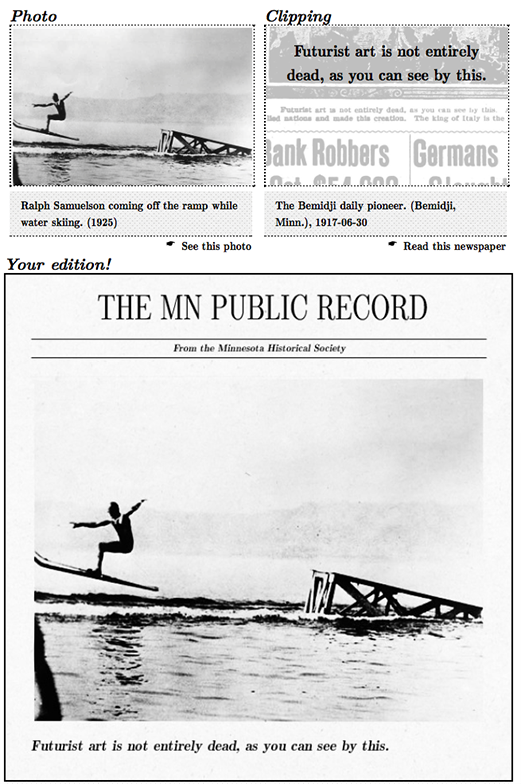 Minnesota History Roulette was a game of chance, an impossible time machine, a historical mashup generator, in which players would push the "SPIN" button to free-associate their way through the Minnesota Historical Society's photo and newspaper collections. It was made possible through an IMLS Sparks! Ignition Grant for Libraries and Museums. A chance spin on the History Roulette machine would combine random pairs of image and caption elements into a mock newspaper front page—often making comical or otherwise interesting juxtapositions, and generating curiosty about MNHS collections. Clipping—Futurist art is not entirely dead, as you can see by this. (Newspaper link).